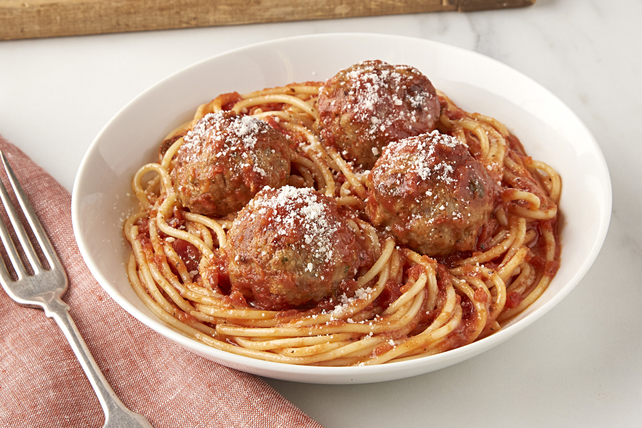 Try out our pork meatballs with your family tonight. Our tasty pork meatballs recipe is great served with spaghetti (or your favourite pasta!) and a tossed salad on the side. Cover rimmed baking sheet with foil; spray with cooking spray. Mix first 6 ingredients just until blended; shape into 32 meatballs, using about 1/4 cup meat mixture for each meatball. Place on prepared baking sheet. Bake 16 to 18 min. or until done (160ºF). Transfer meatballs to Dutch oven or large deep skillet sprayed with cooking spray. Add pasta sauce; stir to evenly coat meatballs with sauce. Cook on medium-low heat 15 min., stirring occasionally. Meanwhile, cook spaghetti as directed on package, omitting salt. Drain spaghetti; place in large bowl. Add meatballs and pasta sauce; mix lightly. Sprinkle with cheese. Loosely pack cooled baked meatballs in freezer-weight resealable plastic bags. Lay bags flat in freezer so meatballs freeze individually. Freeze up to 3 months. Thaw in refrigerator several hours or overnight before using as desired.